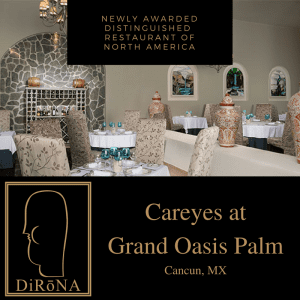 We are pleased to announce our newest DiRoNA Awarded restaurant Careyes Restaurant at the Grand Oasis Palm in Cancun, MX. This restaurant features a romantic atmosphere with both a Mexican and French touch. Each dish will please your eyes as well as your palate. DiRoNA awarded restaurant Benazuza Restaurant at the Grand Oasis Sens in Cancun, MX is located on a sister property.